Presenting ourselves during an interview process is something like introducing ourselves briefly taking consideration of the assigned time limit. It may be possible that explaining oneself in an interview takes a brief moment. Sometimes it happens that in some of the interview process, they try to limit a certain time frame and candidates need to clear their interview within that given time. It is preferable that to impress a panel of an interviewer, a candidate need to put his / her best foot forward. Time frame creates certain kind of boundaries and these boundaries can also freak someone or a candidate. Most of the time it happens that as all the candidates applying for an interview seem a little nervous. To avoid such nature of nervousness a candidate need to be confident. And if an interviewer tries to trick you with a certain kind of time frame of 30 seconds, then the candidate need to follow all the steps given below to be successful in his / her job interview. A first thing a candidate needs to keep in mind while attending an interview is to impress an interviewer by an accurate projection of personality, it is necessary to understand all the elements of job profile. It means a candidate should impress an interviewer with his/her minimal time delivery of projection. The candidate who is deserving a position in that company needs to know that his/her understanding about certain job description may turn out as a plus point. During presentation of an introduction of a candidate, it is very common that the employer may expect something different in their presentation. Therefore, before going for an interview a candidate need to keep in mind that how he / she is going to approach the employer and try to plan their presentation. Most of the people present themselves in a very common format and it may seem a little boring too. So it is better if a candidate tries to present his / her introduction in a different or unique manner. While answering the introduction part of an interview, a candidate need to keep in mind that while introducing themselves it is better to conceal his / her answer in a clear way. For example, a candidate starts his / her introduction with their name, profession and their career expectation. This kind of introduction may impress an employer during the interview process. It is very common that most of the candidates use such manner of introduction. It is possible that while performing any kind of activity, people who be as an audience seem to get bored of such things. Even this kind of environment can be created in an interview process and it is possible that the employer might lose interest in the fact that you are presenting. At that time a candidate needs to boost the energy of the room by including some kind of personality skills. These personality skills are those skills which hold the attention of the employer. To make an introduction part interesting or to create an impression over an employer, it is possible that the candidate might prepare such kind of introduction speech which is very difficult to understand. By using fancy words and statements a candidate thinks that he/she can impress such employer by those kind of speech. But actually it is a wrong way, instead of making things difficult for the employer it is better if a candidate tries to start introduction with a simple and easy format. While presenting an introduction to an interview it is very important to be heard clearly. Sometimes most of the candidates fail to reach the employers expectation because of their low voice module. A person who is presenting a presentation should have an audible voice which can make everyone interested in the presentation. Therefore, during an interview a candidate need to be heard clearly to bag that opportunity of job offer. Every company who expects something from their candidates for the sake of their company would definitely expect that the interview process shouldn’t be very long as time is valuable for them. This is a very charming way of acing an interview in 60 seconds. It is good to hear something good about ourselves from others. Similarly, in an interview process a candidate expects that complimenting the employer with grace may work good for them. Therefore, a complimenting statement before introducing yourself may add an extra credit points to your selection sheet. When a candidate tries to impress an interviewer by throwing some of the compliments on his / her side then it might be considered as a great move towards selection. Once the phase of complement fades, then it is time to charm the employer with some kind of modesty and confident answers. Everyone like confidence with a pinch of modesty. Therefore, after the approach of modesty and confidence be in a very peak point, it is best that a candidate presents himself / herself with confidence. If a candidate fails to bag that opportunity then it is time for the final strike and that is by greeting him / her with a pleasant manner. And trying to build a contact with that person by exchanging some of the business cards so that in future if there are any similar opportunity then the employer can feel comfortable to contact that particular candidate for the post. This is one of the great move which always ends up grabbing opportunity in every field. Once the interviewer decides that he / she should or shouldn’t select that candidate for the job, then it is very important to show the employer a little gratitude towards his / her time. By expressing appreciation towards his / her time, a candidate can leave his / her office premise with a positive gesture in the employer’s mind. Therefore, it is favorable that the candidate needs to appreciate the employer for the level of patience and time towards him / her. There is a possibility that the employer expects his / her time to take it in a precise way and that’s why it is very important to treat his / her time in a productive way during the interview process. Here are some of the ways to pitch ourselves in 90 seconds in the job interview and they are as follows. While introducing ourselves to the panel of interviewer, a candidate need to keep in his / her mind that the presentation of his / her career history should be clear and concise. It is necessary to present a career history within two sentences so that the employer won’t be bored of the projected information. Therefore, it is very important to hold an employer’s attention with a short and concise answer. As mentioned earlier, an employer expects that every candidate needs to prepare their presentation before, so that there won’t be any kind of time waste in the interview process. A candidate needs to deliver his/her brief summary of accomplishment within two or three sentences to avoid boredom. Some people feel great explaining their accomplishment in a descriptive manner, but during an interview it is a very wrong move to make. Most of the time an interviewer asks such questions like future career expectation, but some of the candidates deliver their answer with a determination towards their professional career and there are some people who keep their personal expectation in the form of professional career plans which is a wrong thing to do while facing an interview. Therefore, a candidate need to brief the employer about his / her career plans within two sentences which might catch the employer’s attention. To conclude this discussion, we would definitely suggest that every candidate needs to understand the actual requirement of the employer of that particular company. If a candidate finds a way to understand that particular requirement then there is a possibility that a candidate might be finalized for that particular position that the company offered. 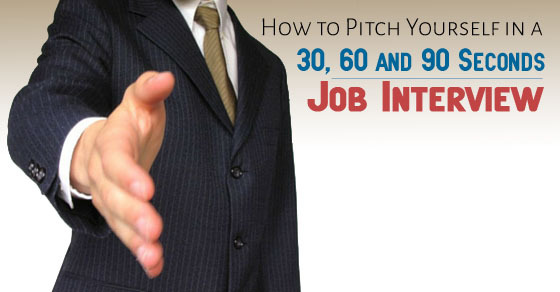 Therefore, to ace an interview in 30, 60 and 90 seconds, an applicant need to follow all the mentioned details to pitch ourselves in the job interview.